Using the Keurig coffee machine is one of the easiest and quickest ways to make brewed coffee. You will feel its convenience, especially in the morning when you want to drink a nice cup of coffee before taking on the day’s challenges. This type of coffee maker has been very popular in households and workplaces because of its ease of use. Do you own a Keurig but do not know how to use it? Worry no more! This post is here to teach you how to use a Keurig. We have here detailed step-by-step instructions on how to successfully operate one, along with some tips. Some of you may be too lazy to read instruction manuals, so I decided to show you how to use this machine properly. Keurig coffee machines are a bit expensive and we’re here to help you fully utilize the machine so it won’t be wasted. Read this post in its entirety and you will be provided with valuable information that may come in handy especially if you are always in a rush in the morning. In order to successfully brew a cup of fresh coffee, here is everything you need. You may choose to keep these at reach so you can save a lot of time. Once you have all the materials ready, you may now start brewing your coffee. Remember to read the instructions carefully to prevent wasting a freshly brewed cup of coffee. Turn your Keurig coffee machine on. You have to connect the cord of your machine into the nearest power outlet. After doing that, press the power button that you can normally find on the upper right panel of the coffee machine. Fill the reservoir with water. You can pull the lid out of the water reservoir, which you can find either on the left or rear side of the machine. You may lift the lid from either side and then add the desired amount of water using a mug or a cup. You have to always remember that you cannot let the water level above the line that says “Mix Fill”. With regards to the water, it is highly recommended not to use hard water, as they leave more debris over a period of time. You can use spring or filtered water instead. Place your cup just below the fountain. The cup must be situated within the drip tray plate to catch the brewed coffee. You have to take note that if you are using a mug, you may adjust the drip tray and place the mug on its base. To start brewing your coffee, place the K-Cup perfectly inside the machine. To do this, pull the handle out in front of the machine and insert the K-Cup inside it. You don’t have to make any action on the seal of the K-Cup. You just have to simply insert it into the coffee machine. 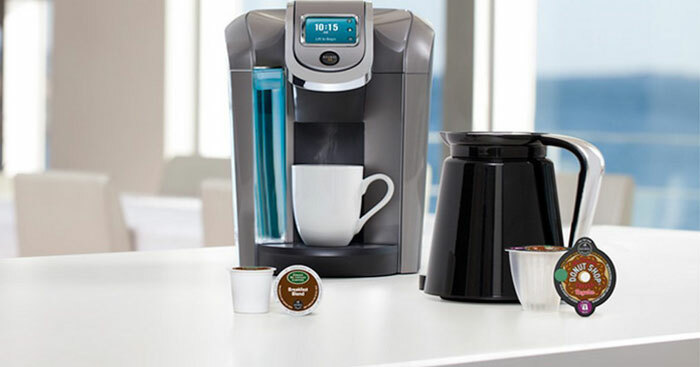 The brewer incorporates a technology wherein it goes through holes in the seal and in the K-Cup’s bottom as you eventually close the lid to allow the water to flow into it while brewing. Depending on the model, you may have to push the Brew button to begin the brewing process. In other models, you have to select a size first before you can start your brew. If the Keurig model you have requires you to choose a mug size, you may pick one among the following: small cup, which is 5.25 ounces, small mug which is 7.25 ounces and large mug which is 9.25 ounces. Remember to just leave the machine while it is in the brewing process. Do not attempt to move your mug or pull the top handle out. This process may take at least a minute, or sometimes two. You may now get your freshly brewed coffee once there is no liquid coming out of the machine. You must be aware of the sizes of your cups and mugs. If it overflowed the first time, choose a larger one on the next brewing. Unplug the Keurig coffee machine from the power outlet and store it in a dry place. In case the coffee machine starts malfunctioning at the middle of the brew, check out how to troubleshoot in order to make it start working again. Use a measuring cup for the water, and a measuring spoon to make sure you have the right amount of ground coffee you will place in the reusable K-Cup. The reservoir lid should be closed after pouring water in. Lift the K-Cup’s compartment in order to place it inside the machine. Press down the reusable K-Cup until you hear a clicking sound that indicates that a hole has been punctured. This will allow water to run though it while brewing. After closing the K-Cup compartment lid, you will hear a sound of water gurgling inside the coffee machine. Let the machine do the brewing for a minute or two. Always have a cup or mug ready at the drip tray plate so that your coffee won’t spill. In order to consistently make a fresh brew, here are some pro tips to help you. To add, included here are maintenance tips on how to take care of your coffee machine and thus, prolong its lifespan. Take out the used K-cup. In order to do this, pull out the top handle to get rid of the used K-Cup and dispose it. It should be noted that you have to let the machine cool first before taking the K-Cup out, as it is very hot after use. If you find mineral build up, stains or a full tray plate, this is the perfect time to clean your coffee machine. A soft damp piece of cloth can be used to clean the exterior parts of the machine. You have to slide the drip tray out of the machine in order to effectively clean it. You may also use water and soap to rinse it with. For convenience, you may place the K-Cup pack holder on the top rack of your automatic dishwasher. Always remember to clean parts separately. To add, never attempt to submerge the whole coffee machine into the water to clean it. Descaling is recommended every three to six months. To do this, prepare 20 to 48 ounces of undiluted white vinegar and a ceramic mug. These will be poured into the reservoir and then brewed after. It should be noted that a K-Cup is not required to do this task. After maintenance, remember to store the coffee machine in an upright position. Do not forget to keep the machine in a dry environment, one that is not too freezing and not too hot. Keurig coffee machines are not cheap and it is important that you know how to fully utilize the unit. This may seem tricky and confusing at first use but I am sure that you will get the hang of it once you start using it on a regular basis. It is best that you are aware of this especially if you need freshly brewed coffee to start your day. Did you enjoy reading this informative post? If you have any questions, suggestions, or anything that you want to add, please feel free to leave a comment below.